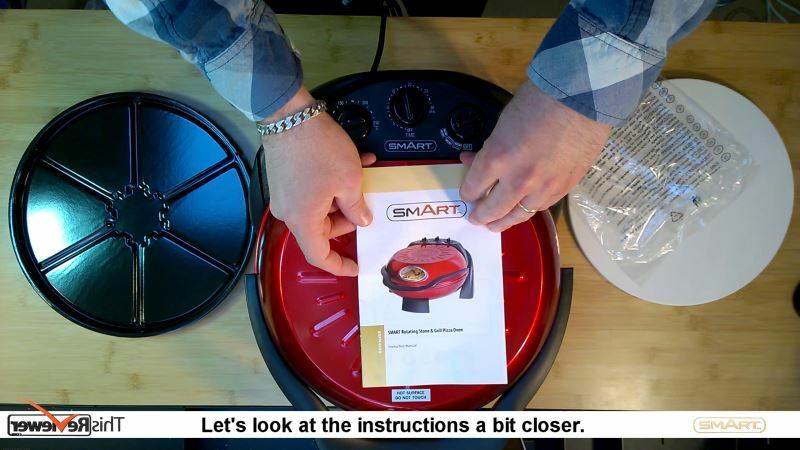 Today we are cooking with a new pizza making machine from Smart. 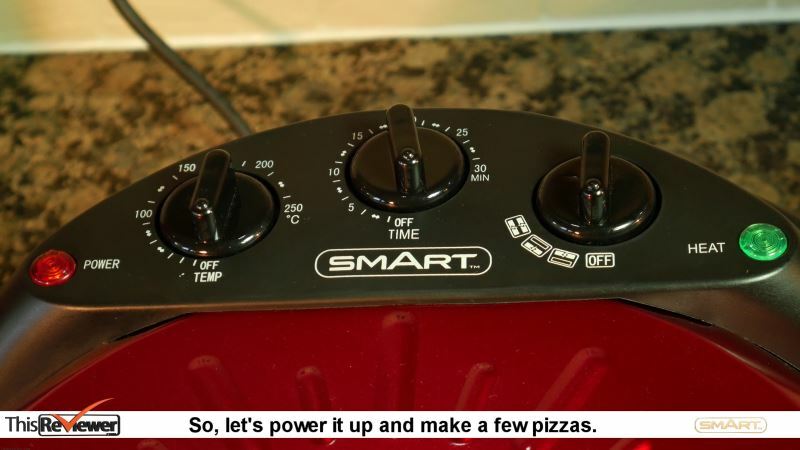 This one makes it easy to bake a pizza without the hassle of using a main oven and waiting time for it to warm up and as you are not using the entire oven is super economical to run as well. 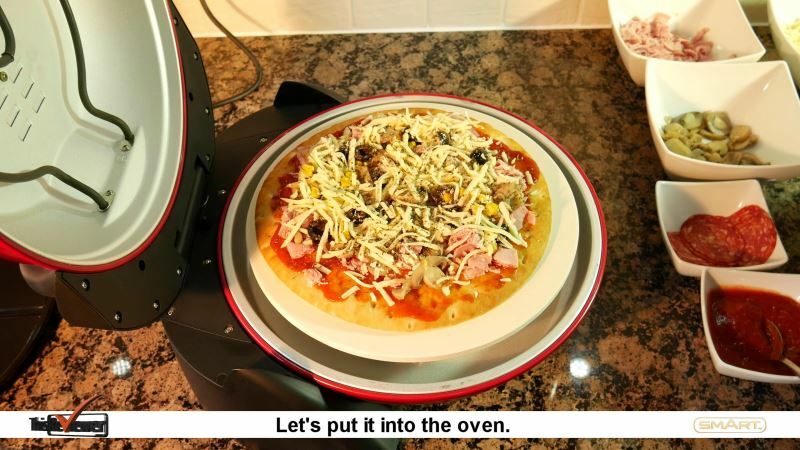 The entire idea of this machine is to make pizza, or indeed hot sandwiches, an ease to make with the minimum fuss. Using the metal base, you can also make omelettes and a raft of other meals such as fries, chicken nuggets, anything you can cook in an oven as well.We should really see this as a mini oven instead of a pizza maker! Massive range of uses, like a mini oven! Can’t wait to see an even larger version! 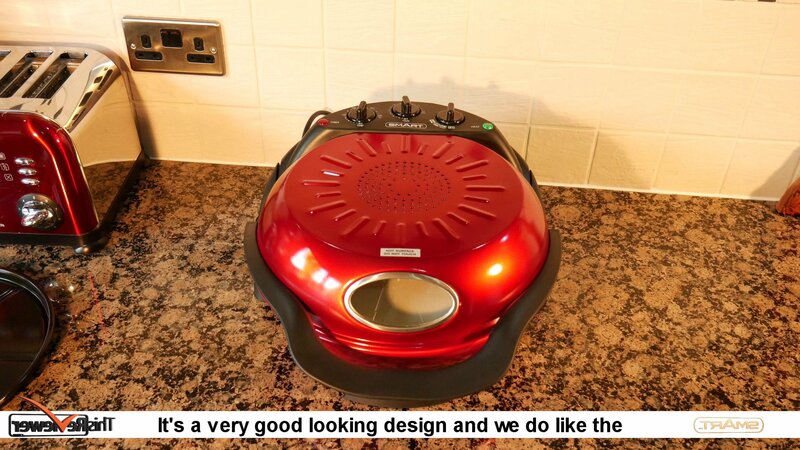 The Pizza Maker itself is Retro red and in a clam shape, with heating elements in both the base and in the top. This allows for an even heat, BUT you can switch either of them off during cooking, which is a smart way to allow for extra cooking time for the base or for the top (extra crispiness) to be achieved, this flexi cooking you don’t really get with an oven! This pizza oven will do the cooking to perfection every time without the need to use an entire oven here. 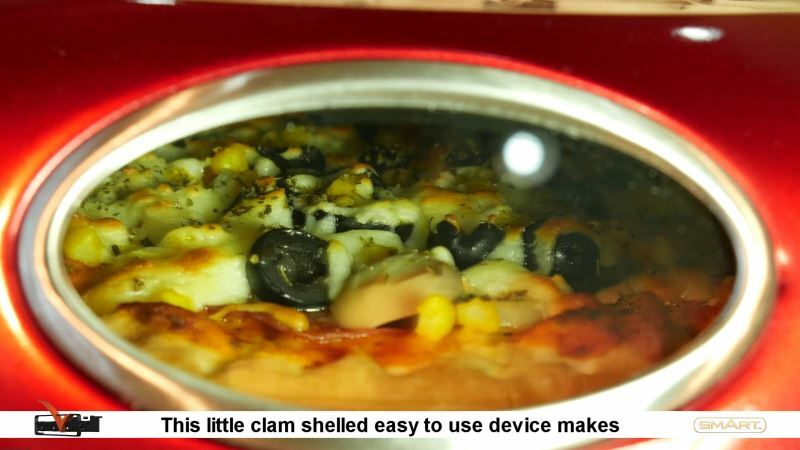 This little clam shelled easy-to-use device makes a fresh and delicious meal in no time at all. We reckon that it’s a lot more economical to use as well as the surface area need to be heated is so much smaller than an oven and it’s also easier to see its cooking progress than using a normal oven. As they sent us the entire machine we decided to make a few pizzas, four to be exact, but we are only showing 2 in the video. We also included the unboxing of this machine at the end of the video. We think it is always fun and informative to see what you actually get in the box as some boxes out there consists of 90% air. 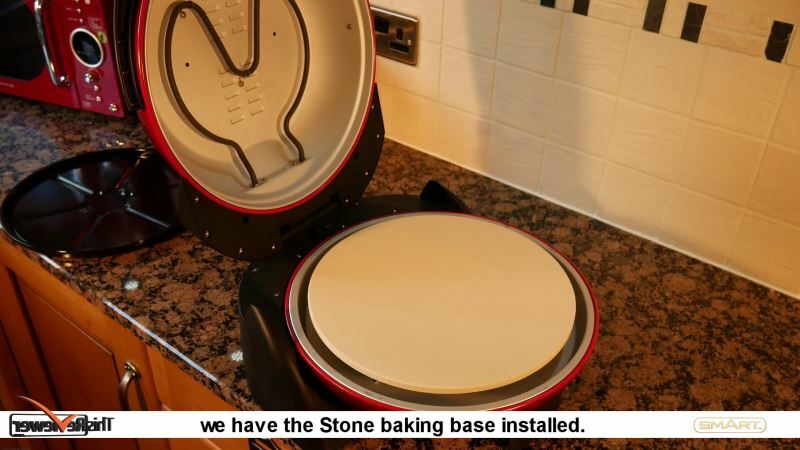 The Pizza Maker comes with two main cooking surfaces and we tried the stone one with this article and video. The metal surface is for deep pan pizzas and is just as well made as the stone surface that we used here. 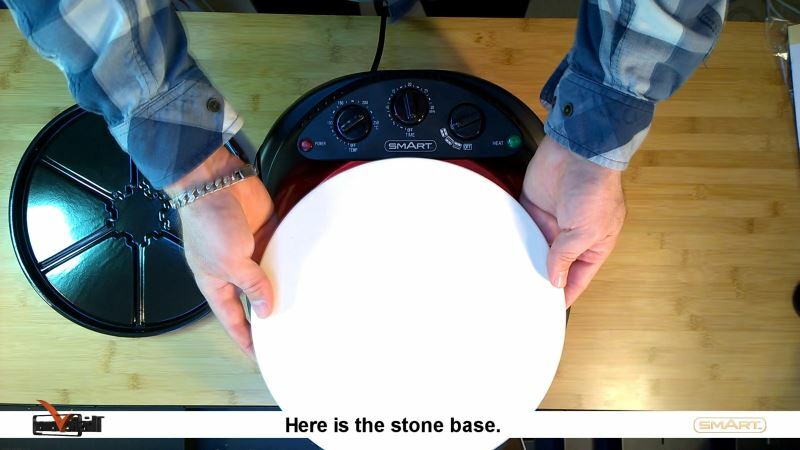 Because the surfaces are higher than the metal lip of the pizza maker shell it is easy as anything to slide the made pizza on and off the stone surface. 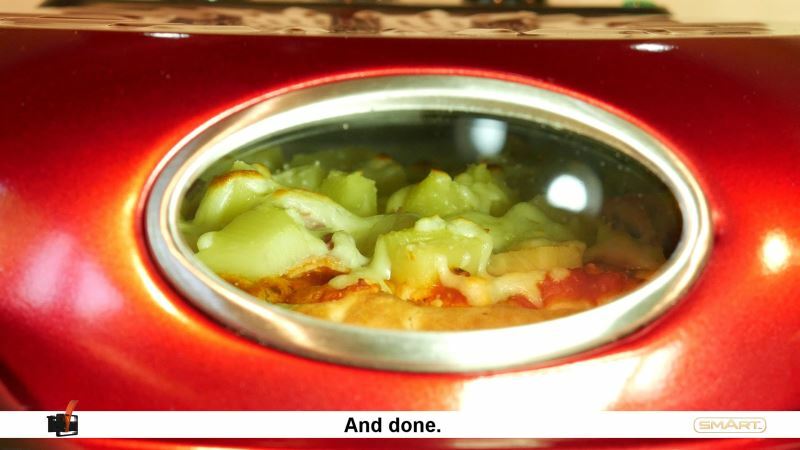 The Deep pan pizza is intended to be lifted out of the machine which is, again easy as it is simple to lift out the metal tray. You have a cooking temperature dial, timer dial and an ON to how many heating elements you want dial. To use this pizza maker is simplicity itself and these controls do give you the flexibility to cook your pizza or hot sandwich any which way you want. We did some experimentations and found that for a fully loaded pizza, one where we over-loaded with ingredients a bit, needed 14 minutes on 220 centigrade, then another 2 minutes using just the top heating elements to make it crispy. The controls also got two indicator lamps, one red, for power and the Green one that shows when your set temperature has been reached. We decided to try this out and, actually, make some pizzas! 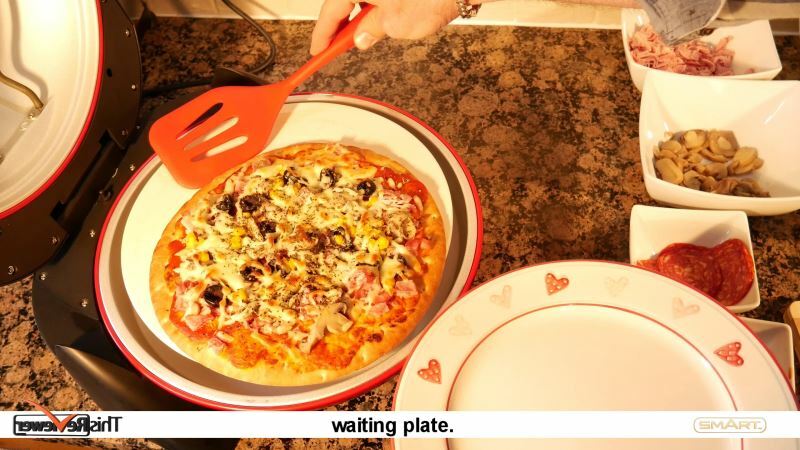 This one is made using a pre-prepared pizza base and we topped it with mushrooms, ham, sweetcorn, olives and cheese. It took about 5 minutes for the Pizza Maker to heat up. We set the time for 10 minutes at 200 centigrade and both heating elements engaged. This is a great feature of the Pizza maker as it allows you to see the cooking in progress without having to open an oven door or indeed bend down every five minutes to try to see through a smudgy oven door window. As can be seen this window is more than enough to show how the cooking is coming along and if it needs more or less time. Sliding it off the base is easy and the smell is fantastic, we decided to make another 3, but, let me show you one more! 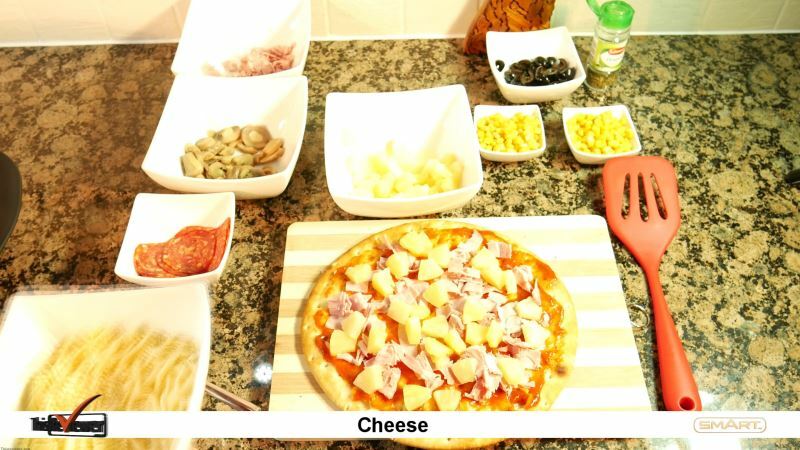 This time we added Tomato base sauce, Turkey, Pineapple and Cheese to our Pre-prepared pizza base. And simply pushed it into the already hot Pizza Maker. 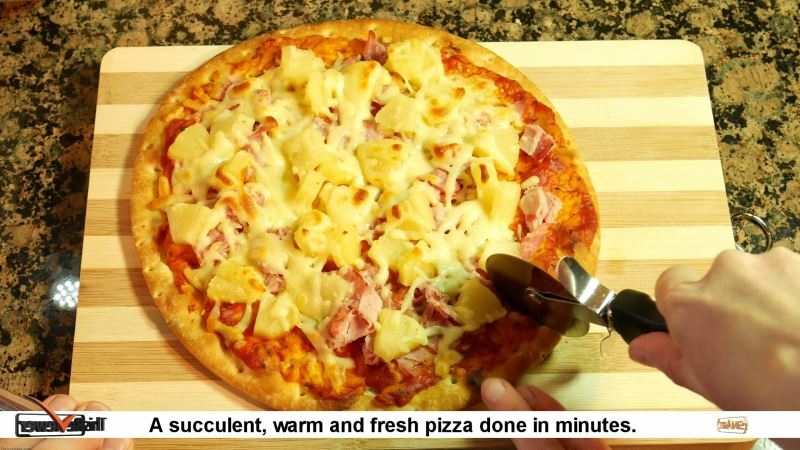 A succulent, warm and fresh pizza done in minutes. The box is, as we expect with a smart product, protected with a security anti tamper seal. 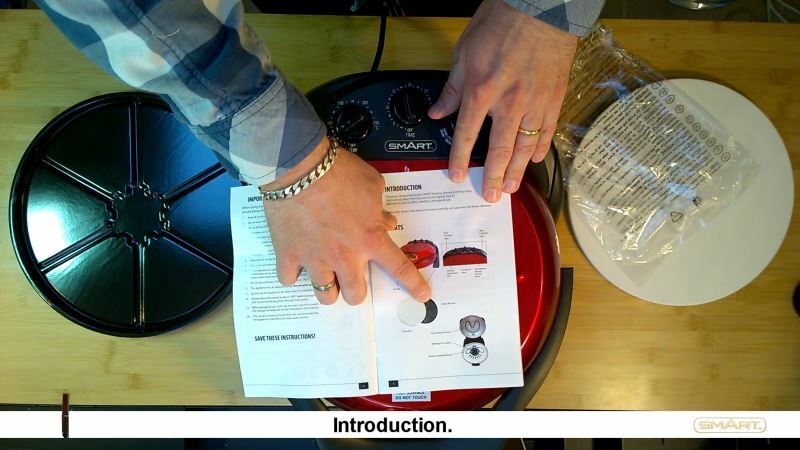 First thing in the box is the pizza maker’s instruction manual. Then we have the stone backing plate. We also get a deep pan pizza plate. • Parts of the machine. • Cooking on the stone. • Cooking using the deep pan dish.